Climate Change Not so Global | Watts Up With That? A University of Queensland study into New Zealand glaciers has discovered a huge disparity between Southern and Northern Hemisphere climates, during the natural warming which occurred at the end of the last Ice Age. The new study overturns the previous consensus that glacial retreat occurred globally at the same time – the study shows that glacial retreat in New Zealand was delayed by thousands of years. “This study reverses previous findings which suggested that New Zealand’s glaciers disappeared at the same time as ice in the Northern Hemisphere,” he said. “We showed that when the Northern Hemisphere started to warm at the end of the last ice age, New Zealand glaciers were unaffected. “These glaciers began to retreat several thousand years later, when changes in the Southern Ocean led to increased carbon dioxide emissions and warming. The study described in the press release, in my opinion, has interesting implications for modern climate change. Even if alarmists are right about climate sensitivity to CO2, if the Pacific Ocean has the capacity to retard major climate shifts, for thousands of years, then we have thousands of years to solve any problems we might be causing – which kind of takes the urgency out of the issue. August 4, 2014 in Glaciers, Paleoclimatology. No. This just makes things worse. All the CO2 caused heat will stay in the northern hemisphere. London will spontaneously ignite while Australia stays balmy. Well, we are the lucky country Frank. So CO2 effects are hemispherically dependent. ‘It is a capital mistake to theorize before one has data. Insensibly one begins to twist facts to suit theories, instead of theories to suit facts.’ (Sherlock Holmes). The new study overturns the previous consensus that glacial retreat occurred globally at the same time. Was that a 97% consensus? This is wildly at odds with the ice cores, The Antarctic cores suggest that the warming started some 17-19,000 years ago (Vostok, EPICA dome C) while the Greenland cores (GISP-II, GRIP, NGRIP) suggest a delayed warming till 14,500 years ago, the Bolling event. I not a Kiwi, but Rogerthesurf is. As far as I know, there are still glaciers in South Island, there was talk of one that was shrinking but it was from erosion not climate change. South Island is very mountainous, snow on the peaks, and volcanic. So if you are interested watch the trilogy of Lord of the rings, particularly the second film, ‘Two Towers’ South Island has completely a different topography than North, and parts are still unexplored, the population is not as large as North Island but the is a tectonic ridge going through to North Island, that cause earthquakes. And one subterranean one, on the west side, that if it drops or collapses it can effect eastern coastal Australia from a big tsunami. Hope it stays stable. Blockade polar vortex in the region of Australia cools Australia and New Zealand. Humanity will have far more real and pressing problems, and to look at events in Gaza, already has. Perhaps some enviro should calculate the carbon footprint of ‘Protective Edge’ and call for Israel to be procecuted for crimes against humanity. They seem to get a free pass on the rest. I prefer to stick to the idea that, major ice advances, even what you might term ‘smaller’ [MWP, LIA etc] geological climate T fluctuations are pretty well reflected – on and across the globe. However, if you ask any Aussie, he will tell you that, the Kiwis always like to be different. Blockade polar vortex in the region of Australia…. So we are doomed (as always), but not synchronously? When I visited some of the glaciers in New Zealand I was reliably informed that their advance/retreat had more to do with precipitation patterns in high mountain regions than temperature. So if rainfall increased in a warming world, then the glaciers might actually advance for a while as more ice accumulates, until the balance between the extra source of ice in the rainfall and the extra heat below was reached; they wouldn’t automatically just retreat with warming. Always stick to the meme! Why not say “when changes in the Southern Ocean led to increased warming and carbon dioxide emissions!” Sure fits the Ice-Core data, warming first, emissions next! Ho hum! Keep the rent money flowing guys & gals, keep it coming, the taxpayers knows nothing! Ah, August in the California seems to be a great time to think about glaciers. We really only have one mountain here, or should I say volcano, that has many decent size glaciers and that would be Mt. Shasta. In a 2002 survey, they found that between 1951-2002, seven of the glaciers on Mt. Shasta were growing. These glaciers were only first described in scientific literature in 1871 by Clarence King in the American Journal of Science. I seem to recall reading that the climate in California has been wetter than normal the last 200 years and I would think this would be the reason for their growth. If you visit nz South Island, Franze Joseph and Fox glaciers, you will see markers going back to, if I recal, the late 1700’s. There were large retreats (relatively speaking) in the 1800’s and slowed down up until 1985 when they started to advance. Quite spectacular to see and get up really close. read Prof. Colin J. Burrows : “Julius Haast in the southern Alps” has some excellent studies of glaciation over the last 2 million years, with particular attention to the last 14000 years. the advances and retreats have been well recorded. There does appear to be differences in timing of events between the hemispheres. Can anyone identify any meaning to the agglomerated Gorebull temperature? Green Sand see block on April 24, 2014. So it looked May 18, 2014. They are keeping the “CO2-caused warming” meme alive. Mix good science with garbage science and you get garbage science. If I were you Bushbunny I wouldn’t get my climatology from Peter Jackson while he is a great director he is not renowned for factual representation of our geography or our climate. For your edification the volcanoes are in the North Is. The real mountains are in the South Is. We are on the boundary of the Pacific and Australian plates and the subduction zone runs through both Islands. We are currently trying to drill into the Alpine fault zone to get better info on how it operates and it might give info on the likelihood of earthquakes. All our glaciers are currently receding as you would expect as we come out of an Ice Age. This site is primarily used by those who wish to depoliticize science. There are other forums for your particular kind of rant. Take it elsewhere. Interesting that this paper is being so well received on WUWT. The recent paper by Neukom, Gergis et al. also discussed the marked divergence of temperature trends in the two hemispheres prior to the 20th century and was more or less universally excoriated. Maybe the fact that it provided evidence that the mediaeval climate anomaly was a N. hemisphere phenomenon, with the S. hemisphere showing distinct cooling at this time, has something to do with that. Perhaps it isn’t just the “warmist” side of the the debate that clings to certain sacred truths. It looks like the opposite may already be starting to happen Now, S hem will enter a little ice age first then N hem with low solar. This has to do with S. Hemisphere current sea ice. Many say that increases or decreases in solar do not directly effect earths climate. I have been seeing many connections with solar cycle #24 since it is a quiet cycle and Static of strong cycles is not blocking the True Data. Maybe Leif can comment on my chart that clearly shows matching dates with increasing TSI and effects on S Hem sea ice growth. Increases in TSI slow S hem sea ice growth. Is it the TSI it self or is the increase effecting the weather pattern with each increase of decrease? Given the bi-polar nature of the poles that we are seeing right now it’s not too hard to envision differences also occurred in the past. I take the headline to mean climate is literally not changing in some places. Really? On what time scale? I’m sick of the two words “climate” and “change” being forced to mean something they don’t. Frank, my experience with the harrops of this world is that Australia is already balmy. Raymond, exactly right! Greg’s anti-semetism is not welcome in the slightest, and if he wants to spread his manure, he should just rack off to some like minded Nazi site. Mods, could you please note? must admit i heard only a few moments of the following, but there may be some brave people who would like to hear what Chris Turney has to say now that he back in the public eye once again in case it is relevant to this discussion! The Antarctica is still one of the least explored regions on the globe. But for the past 100 years, numerous explorers have tried to solve the mysteries of this continent. The Australasian Antarctic Exploration 1911-14 provided a unique dataset against which we can compare the changes in weather and sea ice seen today. Last year, Professor Chris Turney led an expedition in the footsteps this exploration – and he presents the initial findings in this talk from the Royal Institution of Great Britain. Chris Turney will present the initial findings of the Australasian Antarctic Expedition 2013-2014, and show how private funding brought the public and science together. This event will be chaired by Alok Jha, Science Correspondent at The Guardian and soon to be at ITV News. Unsettling news for the settled scientist. Bravo, great observation. This coincides with changes in the galactic radiation. That is, when radiation increases, the polar vortex slows and ice as well. Large ice growth in July, corresponding to an increase in solar activity and galactic radiation falling. GCR strongly ionizes the atmosphere, especially in the area of ​​the magnetic pole. It looks like the opposite may already be starting to happen Now, S hem will enter a little ice age first then N hem with low solar. This has to do with S. Hemisphere current sea ice. This reinforces one of my thoughts as to how ice ages (and LIAs) occur. 1) With the planet tilting the SH a little more towards the sun, the sun experiences a series of weak cycles lowering the TSI. 2) The sea ice around Antarctica expands reflecting away more solar energy and cooling the Southern Ocean. 3) These cold ocean waters flow up the South American west coast creating more persistent La Niña conditions. 4) The effect of this ENSO change creates a near permanent negative PDO. 5) The -PDO leads to polar incursions over land areas in the NH, that is, more polar vortex flows. 6) With lower solar energy in the NH and the cooling effect of the polar winds, we get more snow and ice builds in the Arctic. 7) More snow and ice reflects even more of the solar energy and the planet cools. When the sun returns to stronger cycles the cooling may or may not abate based on just how much snow and ice have accumulated. With enough ice the planet continues to cool and a full glaciation event takes place. With enough solar energy in the NH the snow and ice melts and the planet starts to warm again. Changes in the TSI is mainly in the range EUV and CUV which causes a decrease in ozone over the equator. In conjunction with the increase in pressure over the poles gives a north-south circulation in the tropopause. Mix good science with garbage science and you get garbage science. Does this work sorta like homeopathy? Great! Now if we can just move all the folks in California to New Zealand, we’ll be all set. Oh wait, what do we do with the displaced sheep? Let’s see operating distance the southern jet stream in the Pacific. The stronger the wind, the stronger acts on the circulation in the troposphere. Let’s see the current temperature in New Zealand and Australia. Is there a way someone can check the temperature records of a State vs the global temp? I ask because here in Massachusetts we aren’t seeing the warming part of climate change so I wanted to check it against the global temps on NOAA. The point being is we may be observing a shift in the weather pattern, which in turn affects the climate. And the shift could be caused by a number of factors including the Earth’s wobble and precession. With the difference in ocean volumes, the northern and southern hemispheres are different animals when it comes to climate change dynamics, so the present article does have credibility, somewhat diminished by the reference to CO2. Exactly how did they date these ‘moraines’? By carbon dating samples found at the margins? Such a date implies the moraine was exposed at the dated time, but does not exclude it being exposed at earlier times, but that record was erased. But he makes a good point, really. Just how much good does it do to kill coal and freeze out fossil fuel as energy sources because of carbon dioxide, when war creates hellish amounts of it? The war in Gaza, the war in Syria, the war in Iraq, and the one in Ukraine have undone any benefit that was ever gained from efforts to reduce carbon dioxide for the last decade. We quickly condemn SUVs that run on gasoline, but we look the other way rather than condemn war as a destructive force in the environment and as a source of pollution. Oops, far better to attack a cow fart than 1000 pound bomb. 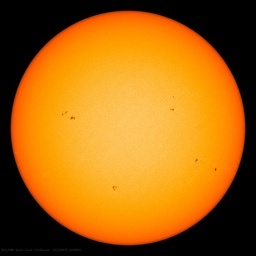 Current increase in solar activity will cause next jump (record) of Antarctic ice in August. No. More like bringing the Ebola virus into a hospital. Probably because the Northern hemisphere is about 60% water and the Southern hemisphere is about 80%. It’s always amusing when someone quotes a fictional character, especially when the creator of the character believed in all sorts of nonsensical things. Can someone tell me about the melting of the Laurentide Ice Sheet that left behind the Great Lakes of North America. I read somewhere that the melting of this sheet was very fast and sudden. Is that true, and when did it occur? Also, why is everyone so worried about the odd degree in global temperature change? Surely the events that led to the creationg and then the destruction of this glacier are many many times more important given the impact they are going to have on civilisation if those changes happen again. The angle the Globalist warmists will take is to claim that the lack of global warming is due to a southern hemisphere lag. The antarctic ice increase means nothing because of this lag and that global warming is happening faster than ever but the lagging Southern Hemisphere is dampening the terrible, catastrophic effects!!! In my view, it is a bit of a stretch to conclude anything about the state of the Southern hemisphere based on the activity of a few small glaciers situated on a tiny dot in a huge ocean. Thingadonta makes a good point above. Variations in NZ glaciers are greatly enhanced by rain falling from moist westerly winds. The one sacred truth I hold to is the climate is more complex and less understood than the “warmists” assert. My second sacred truth is the science isn’t settled. >> a few small glaciers situated on a tiny dot in a huge ocean. really, given that its land area is about 70% of that of Japan. New Zealand = 0.15% of the surface area of the Southern hemisphere. This strikes me as a continutation of the ongoing debate over a “polar see-saw” effect – a process which seems to logically explain out-of-phase pulsations in the ice of both poles. Other than the fact that warmists can’t directly attribute those phase-changes to CO2, I don’t see how they pick a fight over the (likely) effects of the various Milankovitch cycles. Rod Chilton says: I am not so sure that Glaciers are a very good indicator of climate changes. Glaciers respond to not only temperatures, but to precipitation as well as a reaction to combinations of both temperature and precipitation (whether snow or rain is also vital). And too, there are even some glaciers that react to internal mechanisms such as basal warming between the ice mass and the underlying substrate. New Zealand and its proxy (primarily glaciers) have always shown climate changes out of phase with areas further north precisely for this reason. The Younger Dryas is a case in point. Some but not all proxy (again primarily glaciers) display a mixed signal in New Zealand. Whereas, most studies in southermost South America are in phase with changes further to the north and throughout the Northern Hemisphere. As is one study I am aware of in southern Australia. There is even one study in Antarctica near the coast that shows in phase changes in the Younger Dryas. Though admittedly other lower resolution Antarctica ice core results display the out of Phase “polar seesaw.” So in effect, the study presented here as new results, is not! . Thank-you Rod Chilton, climatologist http//www//bcclimate.com. He managed to get a mention of CO2 in there somewhere, to secure his funding. Darn, us here in Michigan were hoping that we would see some of Al Gore’s promises of hotter summers and disappearing winters. Now the ocean can delay that thousands of years? >> New Zealand = 0.15% of the surface area of the Southern hemisphere. day on any world map. If you flip New Zealand across the equator, and put it in the Northern Hemisphere; and park it off the California coast, then Stuart Island would be way up in the Gulf of Alaska, and North Cape would be below the Mexican border, and Auckland, will be right off San Francisco. So much for dots between your eyes. Also. the Kiwi doesn’t have a tail; so it doesn’t “back up” (can’t). So we sometimes sit on our notail, and think on it. Both Fox and Franz Joseph glaciers essentially come down to sea level, near nice beaches with sun and surf. So it is not like train buff, Pachauri’s Himalaya glaciers, that come down to 18,000 feet. And both advance and retreat now and then. They were both still there in 2006 when I went there, and it was Christmas (summer time). In the past half century, Southern Hemisphere westerly winds (the ‘Roaring Forties’) have quickened 10 to 15 per cent and moved 2 to 5 degrees closer to the South Pole – meaning fewer storms are reaching as far north as Australia. This is why glaciers on the western side of the South Island of New Zealand are advancing or are stable and those on the eastern side are retreating. It would be very interesting to determine whether the same effect applies along the Andes – particularly in Terra del Fuego and Patagonia…. If they are, as I expect; then there may well be a good case to be made that the massively important Antarctic Circumpolar Current (which is wind-driven) is ‘automatically spinning up’ in response to globally increased atmospheric CO2. Some years ago I discovered that the (negative) difference between the global mean CO2 level (or if you like at Mauna Loa) and at all SH CO2 monitoring stations below about 30 S has always been (since measurements commenced) slowly but steadily increasing monotonically – even to as far north as the Southwest Pacific Gyre (e.g. Easter island) and Crozet Island in the Indian Ocean. This suggests that the global band of cyanobacterial productivity influenced by the Current (the biggest on the planet) is very probably also increasing. I also found that that such cyanobacterial productivity behaves differently through an annual cycle in the SH to that in the NH. I published these findingson the excellent Niche Modeling blog of David Stockwell. They appear nowhere in the literature so I claim originality. Think (maybe) ‘Homeostasis’. Think (maybe) ‘Gaia’. Think (maybe) ‘Thank you Drake Passage’…. Of course; as soon as Stephen Wilde says his ‘theory’ predicts all this stuff too I’m off down to the pub to drown these thoughts! Are there not more things of heaven and earth than are dreamt of in our philosophies? Getting my Geology from Peter Jackson? Hang on, mate! I suspect I was wrong about the volcanoes, but surely you agree South Island is mountainous and not fully explored. Anyway, it is beautiful scenery. But is it not true they call it the shaky isles? “These glaciers began to retreat several thousand years later, when changes in the Southern Ocean led to increased carbon dioxide emissions and warming”. I thought that the records showed things warmed up first before the CO2 came out to play, but they keep repeating this cart before horse in the hope that it might become true? OK, fair enough, but there is far too much rampant anti-Semitism these days, particularly amongst the Left and the Greenslime. We (and I am not Jewish, and have no overtly Jewish friends at all) do not need to see a resurgence of racial/religious hate that the socialist/fascists perfected in the 1930’s. Crap is crap, and any right-minded person calls out crap. Failure to do so is detestable cowardice. You wanna calm down mate, we do science with some politics here, taking up cudgels on behalf of others who ably and patently can take care of themselves, all round – is a waste of breath. It’s a chaotic system. Large scale and amplitude changes can occur without notice given the right conditions (e.g. sink, source, or confluence). The assumption is that the system is reasonably stable, which precludes sudden and overwhelming changes. This is the basis for all scientific work and life as we know it. You both labor under the same misconception. Orbital forcing is independent of TSI. TSI measures the sun’s energy output; orbital forcing describes its distribution over the earth. While global variation is slight at the top of the atmosphere (TOA), it is highly asymmetrical between hemispheres, providing more summer heat alternately to each. Moreover due to a highly asymmetrical distribution of land mass and sea ice each hemisphere responds to variable insolation in a different manner. Albedo/ice cover varies much more in the north than in the south. The graph shows T and GHG response to insolation (Milankovitch Cycles). Going from right to left you can see some pretty steep climbs: T and CO2 etc. rise in tandem. What they are really measuring is albedo, i.e., ice sheet extension. Their correlation indicates cause and effect to be sure, but the cause is ice. And when it melts fast–over just a few thousand years–T climbs, the ocean gasses out CO2, and the melting permafrost leaks methane. When one considers what is currently being experienced in Antarctica, one can be forgiven for thinking the southern hemisphere has entered a long term cooling phase. A refreshing touch of real world reality here! I find it interesting that between 2003 and 2010, numerous items of archaeological interest were recovered from melting ice in the Alpine Schnidejoch pass. These date from the Neolithic period, early Bronze Age, the Iron Age, Roman times, and the Middle Ages, spanning a period of 6000 years. The Schnidejoch has yielded some of the earliest evidence of Neolithic human activity at high altitude in the Alps, and clearly proves access to high-mountain areas as early as the 5th millennium BC, and the chronological distribution of the finds indicates that the Schnidejoch pass was used mainly during periods when glaciers were retreating.